Hello dear foodies. Hope you had a great Saturday feasting on delicious food! 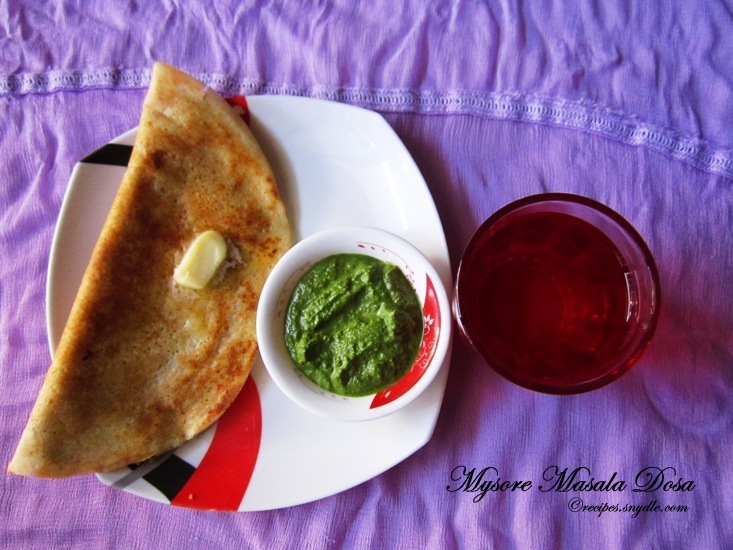 So coming to today’s recipe, it Mysore Masala Dosa! One of my all time favorites, this south Indian delicacy is popular across the nation. Mysore Masala Dosa is a bit different from the usual Masala Dosa. Mysore Masala Dosa is spicy and it gets its heat from the special chutney that is applied onto it. The potato filling is usually a bit subtle to pair well with the spicy chutney. Making dosa is a lengthy affair. But in the end, you will taste satisfaction. You can serve it with sambar and green chutney. However, I didn’t make sambar this time. You can find the sambar recipe here. 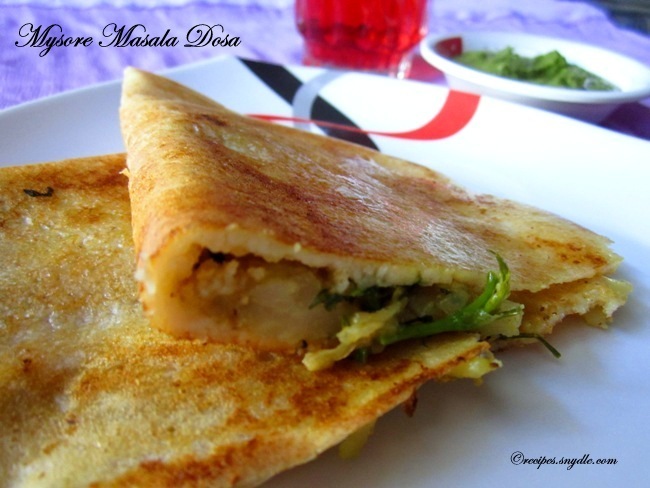 The Mysore Masala Dosa recipe has been divided into 4 parts for your convenience. 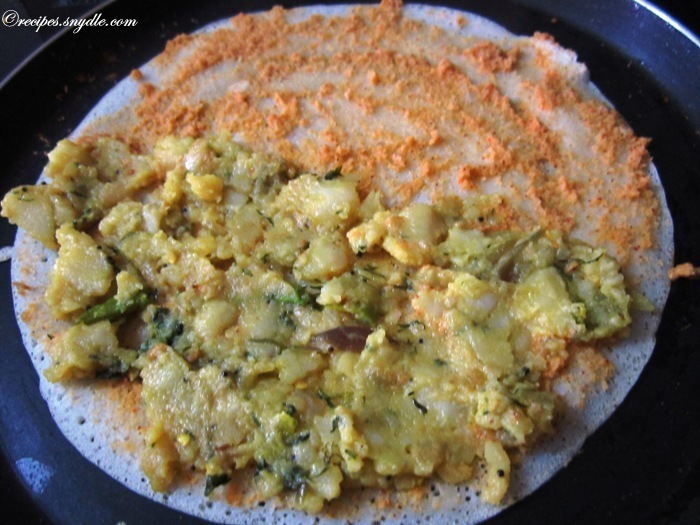 The dosa batter preparation needs to start a day or two before you want to prepare the dosa. The rice and white urad dal/split and skinned black gram need to be soaked overnight or for 7 to 8 hours. The batter takes a few more hours to ferment. 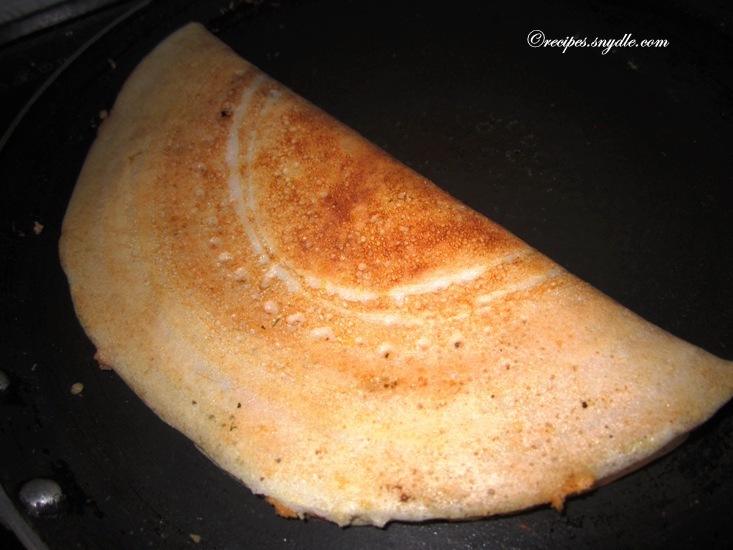 It is very important that the batter is fermented well if you want nicely browned crispy dosas. The most common mistake some people make is that they soak and grind the rice and dal together. The two have different textures and its necessary that they be soaked and ground separately to get the right kind of batter. I added some fenugreek seeds for a nice fragrance. You can make the chutney a day before and store it in an air-tight container and refrigerate it. The potato filling tastes best when made fresh. Assembling the dosa is a child’s play. I hope the pictures will help you. Now let’s get started. This recipe yeild about 20 to 25 dosas. For the purpose of measurement, 1 cup = 250 ml. Wash and soak rice for 7 to 8 hours. Wash and soak urad dal and methi dana together for 7 to 8 hours too. Wash and soak poha for about an hour before you grind the batter. Poha need not be soaked for a very long time. Grind the rice and poha together to form a smooth batter. You can use about 1/3 cup of water while grinding the rice. Remove the rice batter into a large container. Grind urad dal and methi dana using a little water to form fluffy and smooth batter. Go easy on the water. We don’t want the batter to be runny. Remove the urad dal batter into the same container and mix it really well with the rice batter. Make sure the container is not full with the batter. There should be some space because the batter will ferment and almost double up. Close the container and keep it in a warm place for about 8 to 10 hours. It may take a bit longer for the batter to ferment during cold weather. Mix the dosa batter well to combine it well with the froth floating over it. Dosa batter is ready to be used. Soak the dried red chilies in enough hot water for about half an hour. Drain the chilies. You can adjust the amount of chilies as per your taste. Wash and soak the tamarind in hot water too. Use very little water, just enough to soften the tamarind pulp by squishing it with your fingers. In a mixie jar, take dried red chilies, tamarind pulp and all the other ingredients and ground them to a smooth spreadable chutney. Don’t add a lot of water, else it will make the dosa soggy. If you are making it a day ahead, pack it in a clean airtight container and refrigerate. Heat oil in a skillet and then turn the heat low. Add in the mustard seeds and allow it to splutter. Carefully add in the curry leaves. Dry them with a kitchen towel after washing or else they cause the oil to splatter around. Turn the heat up a bit and add in the onions and saute them till they turn golden brown. Add in the green chilies, finely crushed ginger and garlic and saute till the raw smell disappears. Add in the turmeric powder, red chili powder and a generous pinch of salt and stir around. Add the tomatoes and cook till they turn mushy. Add in the boiled mashed potatoes and adjust the salt. Mix everything well. Add in a little water, just a couple of spoonfuls and mash the potatoes well so that they become very soft and can be spread on the dosa easily. Add in the pinch of garam masala and chopped coriander leaves and mix. Cover the potatoes with a lid and allow them to heat up for 2 minutes. Heat a non-stick griddle / tawa on medium heat. In the meanwhile, take the required amount of dosa batter and dilute it by adding water to it. Usually, when you take 4 ladles of dosa batter, 1 ladle of water suffices. And it makes around 5 large dosas. Add salt to taste and mix well. 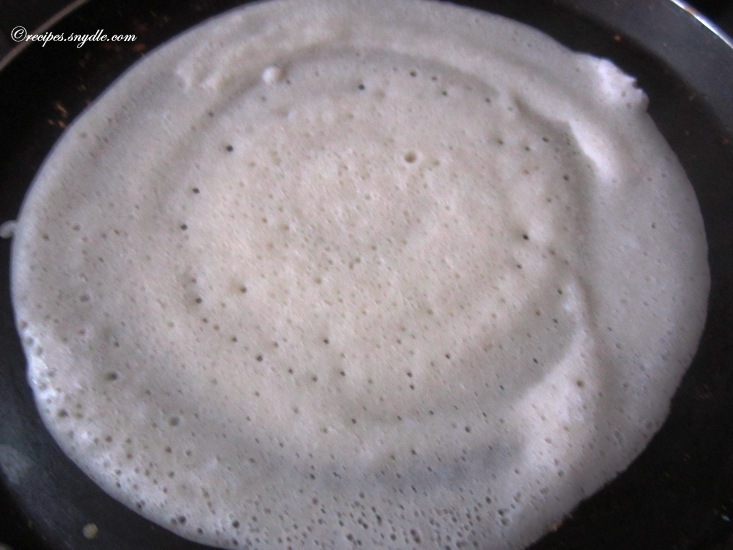 When the tawa is sufficiently hot, pour a ladleful of dosa batter and spread it evenly using the back of the ladle. Allow it to cook on medium flame for a minute till the wet batter dries a bit and begins to set. Pour some oil/ghee/butter over the dosa. Apply a couple of spoonful of chutney we made. Spread it gently. Now gently spread a generous amount of potato filling over half the dosa. Usually, people just place the potato filling in the centre. I prefer to spread it over the dosa till the edges. When the dosa has turned crispy and golden on the underside, fold it in half as shown in the picture. Roast the dosa on both the side for a few seconds by applying some butter. It will become crispy and fragrant. The Mysore Masala Dosa is ready! Serve hot with sambar and chutney. Enjoy!